The big day had come again this year. Saffola along with MHP masala and Oriflame conducted their annual "Oats queen contest" on 7th of feb this year. This time the topic was "Innovative tea time snack" using Saffola oats, Saffola Oil and MHP masala(Masala vada mix/Bajji mix/Adai mix). The difficulty in creating a dish was when western ingredient oats and these typical Indian masala mixes had to be used together in a dish. Mom is super creative. She came up with a sweet dish with such ingredient combination and it was absolutely delicious and worth the title. Oats and dates bajji is a brain child of my mom. She made our favorite kesari with oats and then stuffed them into dates. Isnt it already delicious!! She further dipped it into bajji batter and deep fried it to hide all the fun ingredients. Mix rava, oats, and sugar, add it to the pan when the water boils. Add the food color and keep stirring until it becomes thick. 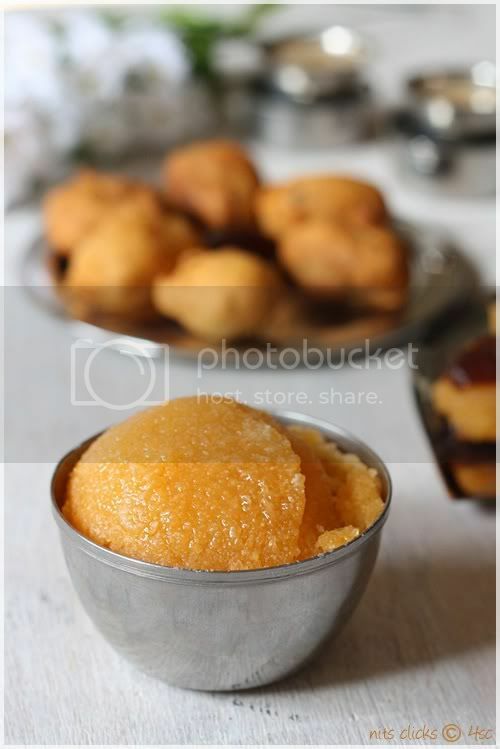 Finally add ghee and cardamom powder and mix well to make oats kesari and keep it aside. Slit the dates neatly and remove the seed. 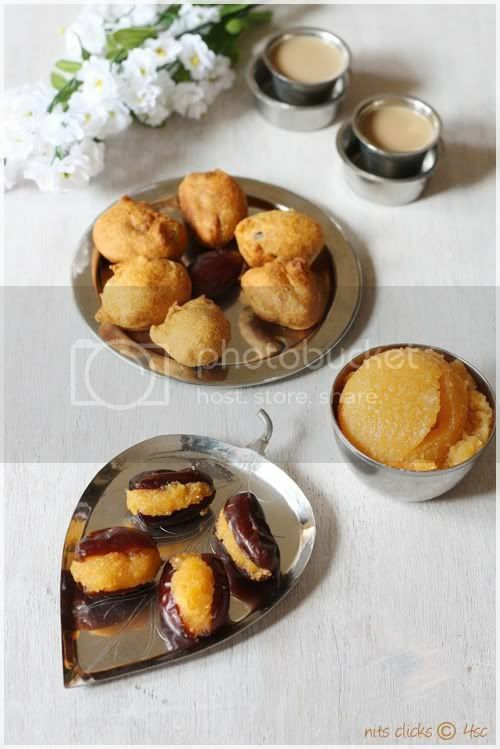 Stuff 1 tsp kesari inside the dates. 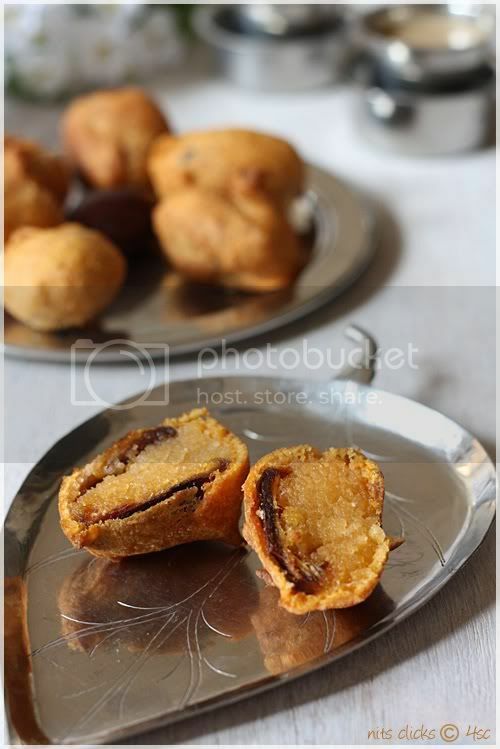 Mix besan, rice flour, chilly powder and salt with adequate water and dip the stuffed dates until it is well coated. 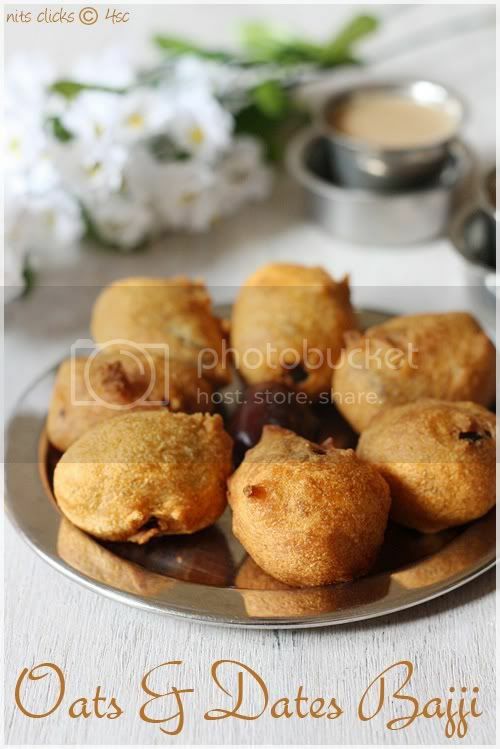 Mix 1 cup of maida with 1/4 cup of corn flour, 1 tblsp of sugar and a pinch of salt with adequate water to make bajji batter consistency and dip the stuffed dates in it and deep fry until well roasted. 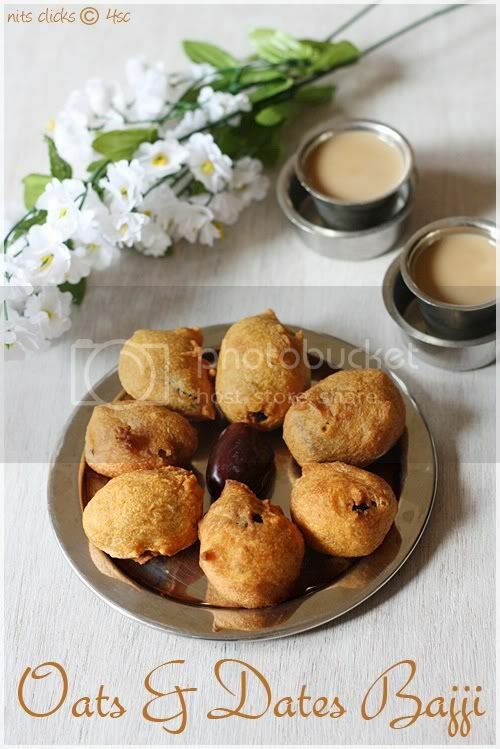 Mix 1/2 cup of besan, 1/2 cup corn flour and a pinch of salt along with adequate water to make bajji batter consistency and dip the stuffed dates in it and deep fry until roast. Superb innovative and im sure would have tasted heavenly. awesome bhaji. Congrats to both of you! Wow!! Aunty is super creative, she deserves to be first!! Loved the flavor combination, congratulations to Aunty!! Can't wait to see your recipe and the other three?? extremely innovative & hats off to ur mom! so innovative and wonderful bhaji !! Wow...very innovative and sure delicious recipe...and congrats to both.. Wow!!! very unique dear. No one will ever think of mixing dates with oats and that too as a deep fried snack. Very very innovative. Congrats to both of you. Hats off to your mom for such a creative creation and plz. wish her on her winning the contest! Looking forward to the series! If not for the picture of the stuffed dates I cant imaging how it can be done.Really neat and innovative.Congrats to both of you. Wow u guys are very innovative.I hope u got this creative from ur mom. wow..now i know where all your creativity & innovations comes from :)Your mom is really super creative..bajji looks awesome & must try!Congrats to your mom & you dear!Eager to see all the other posts of this series!Way to go girl! This bajji is truly innovative and worth the title...I'm very curious about how it tastes. Very innovative and just waiting to see all the recipes!!!!! Wow that is one amazing combination!! 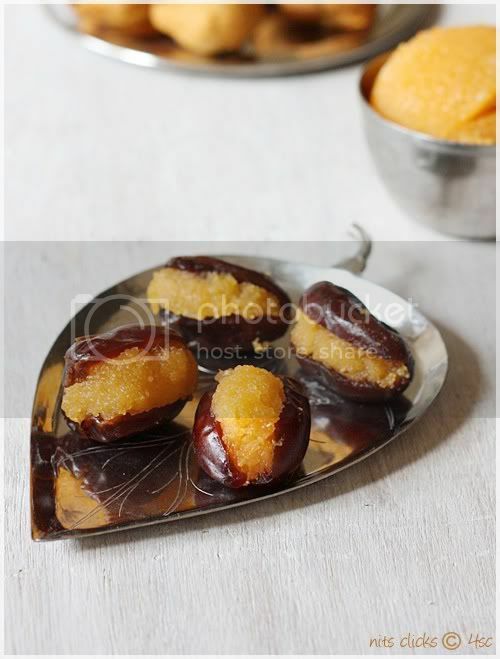 The pics of the kesari, dates stuffed with kesari makes me drool !! Congratulations to Aunty and you !! That's quite innovative Niths. My wishes to you and your Mom. Definitely a prize winning recipe.. Loved the clicks also. Awesome recipe... Congratulation to mom and beti Nithi!!! Hi Nithya, look delicious and tempting. Have a nice day. Wow Wow First congrats to your Mom and you too Nithya and the recipe sounds very very interesting.Looking forward for the other innovative recipes. That is a very creative recipe! Kudos to you mom.. Many congrats! Congrats to both Mom & daughter!!! Lovely creative creations. can`t wait to see the rest. What an amazing fun dish, your moms a genius!! Congrats!! Very innovative, sweet and savory mix. Sounds really interesting. Congrats to you and your Mom. I'll be very glad if you could link your Oats recipes to My ongoing event and help people learn Oats in an interesting way. i like this article, that's a awesome thinking. thanks for share this post with us. i like this post. The first thing I want agario game to do in my official position as jogos twizl author of this blog is thank whoever first duck life games came up with the idea of bloxorz games using the word Indie to describe what I do wheely games. Indie developer. Indie game design. Whoever did this, you deserve the Nobel Prize in Awesomeness.